La Luz Trail Run is a nine mile trail race that starts in the foothills of the Sandia Mountains in Albuquerque and finishes at Sandia Crest at an altitude of 10,678’ – over 4,000’ of elevation climb. The lottery process is open during the first week of May on ultrasignup.com. After the lottery has closed, ultrasignup.com will randomly draw all names and compile a list. The first 400 names selected will be entered into the race; they will be notified and will then pay the registration fee. Those not selected in the first 400 will be placed on a waiting list in the same order as their names were randomly drawn. As cancellations are received from the original list of 400 entrants, persons from the waiting list (in order) will then be offered the opportunity to enter the race. There will be no race day registration and no refunds of entry fees – for any reason. Bib numbers/race entries are NOT TRANSFERABLE. Finish times for unauthorized runners will be discarded = DQ! The race will start promptly at 7 am sharp! The registration fee will be $45.00 for members of the Albuquerque Road Runner Club and $50.00 for non-members of our club. This fee will be collected by ultrasignup.com at the time of registration. Prizes will be awarded to 1st place overall Male & Female and 1st place overall Master’s Male & Female finishers. Age group awards will be given out in the following age divisions (1st, 2nd, and 3rd place male and female): 01-15, 16-19, 20-24, 25-29, 30-34, 35-39, 40-44, 45-49, 50-54, 55-59, 60-64, 65-69, 70-74, and 75-up. Parking is allowed only on the shoulder of Tramway Blvd – no parking will be allowed on Forest Road 333. The starting line is ~0.5 miles up Forest Road 333 from the turnoff from Tramway Road onto Forest Road 333. Allow extra time to get from your car to the Start Line to avoid missing the start. At the “Y” about 0.5 miles before the finish line, you will turn left on Crest Spur Trail, which will take you to the finish line (there will also be a water aid station at the “Y”). T-shirts will be distributed at the Finish Line to Official Finishers. Your race number will be required to pick up your Finisher's T-shirt. Friends of the Sandia Mountains. "Best Trail" Winner for 2014! _The La Luz Trail Run has been sponsored by the Albuquerque Road Runners Club since 1999. Thank you for your continued support of the race and a big Thank You to all the Club volunteers, Ham Radio Operators, and the Boy Scout Troop that handles the two middle aid stations. 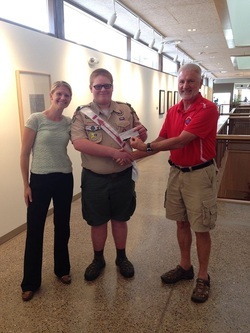 La Luz Race Director Rodger Sack and ARR President Gwen Walker present a check to a representative of Boy Scout Troop #17 for their help transporting water up La Luz Trail for two race water stops in 2014.